I was meaning to write this post last month after the city council meeting on April 16th, but between leaving for Kansas City later that week and end-of-semester projects at work I haven’t really had a chance to sit down and do it. I was rather disappointed by some of the posts on Facebook ahead of that meeting, namely those by city council members including one questioning “why people were posting about a topic on Facebook instead of coming to the council meeting.” For starters, the post in question started out specifically saying to go to the upcoming council meeting on the 16th. Second, people are going to talk things the mayor & council do because they can wherever and whenever they wish, be it on Facebook or at the cafe, whether you like it or not. Second, you complain about people “spreading rumors” yet you insisted people had to come to the council meeting, where you read a canned statement that could have been posted online days earlier instead of leaving things open to speculation over an entire weekend. I still question if the claims about the mayor were truly a rumor, since two years ago I was at a meeting in Boone and was asked afterwards by an attendee (who lives clear across the county from me) “if I had met Madrid’s new Public Safety Director”. I responded “No, we don’t have a public safety director, we have a new Fire Chief..” He then proceeded to tell me about what then-Mayor Ringgenberg had told him. No mention of the city creating this position had been made in the Madrid paper. Why am I finding out things that the mayor & council are doing from somebody on the other side of Boone County before it ever comes up in a council meeting? It’s 2018, time for the mayor & council to catch up with the rest of the world. Glancing at the alert map we now have Winter Storm Warnings posted for most of the northern 1/3rd of the state, down to along the US 20 corridor, and as far down as the US 30 corridor in eastern Iowa from around Benton County east to the Mississippi River. A Winter Weather Advisory is in effect for the remainder of the US 30 corridor west of Benton County and much of the I-80 corridor as well as the I-29 corridor north of US 30. It’s been a couple days and a dozen model runs since I wrote my rough forecast post for the convention I’m traveling to tomorrow (Thursday) so I’m going back and updating things. Lunch: Now that we’re closer things are looking more consistent. Mid to Upper 50s. So I’m taking a short (3hr) road trip south later this week into the weekend so I thought I would work out a forecast and share it. We’re a few days out yet and most of this is based on only one model (US GFS) so it may well change between now and then. Lunch: Things aren’t so consistent here. Upper 40s to around 60. Henry just put up a write-up on the next round of winter weather for northwest & north central Iowa so I won’t rehash that here. So it’s Friday the 13th. Looking at today’s forecast for the state, it’s pretty much all the storms (which of them depends on your exact location). We could see rain, hail, snow, tornadoes, blizzards.. you get it. I have a meeting after work so I will not be out chasing anything and most likely helping with things over at Iowa Weather Network once the meeting wraps up. Are we maybe finally done with winter? Okay so today we have a Wind Advisory going into effect at 9 AM until 2 PM this afternoon for a good chunk of the state for sustained winds of 30 MPH with gusts up to 45 MPH. We also have a Dense Fog Advisory for east central Iowa until 10 AM. Two rounds of freezing rain will move through the state with some areas seeing around a tenth of an inch, while others may see more significant icing with accumulations of around a quarter to half of an inch, potentially resulting in power outages and tree damage. The areas with the greatest icing potential have had Winter Storm Watches posted. More details will be coming later today. 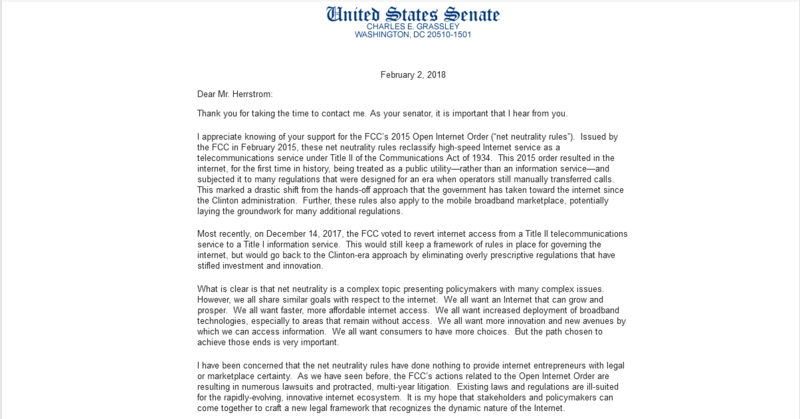 So I received an email from Senator Grassley yesterday regarding Net Neutrality. Just a short post as the National Weather Service just released some updates regarding the approaching winter storm. 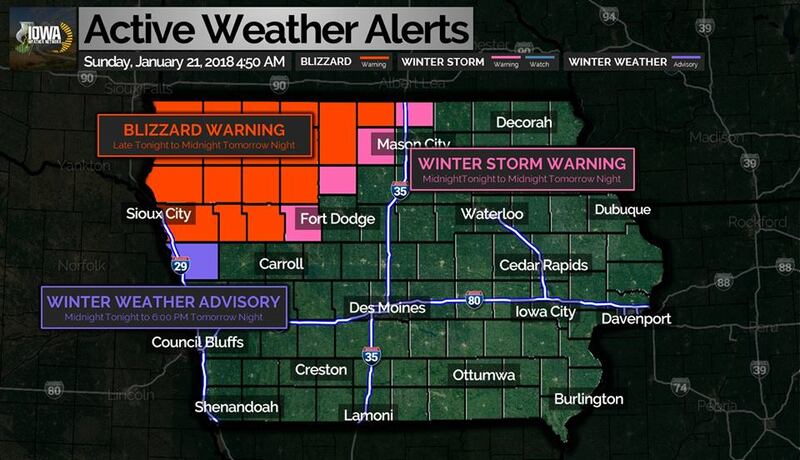 The Winter Storm Watch in effect for northwest Iowa has been upgraded to a Blizzard Warning which goes into effect at 9 PM tonight until midnight Monday night (Tuesday morning) for the following counties: Plymouth, Lyon, Osceola, Dickinson, Sioux, O’Brien, Clay, Cherokee, Buena Vista, Ida, and Woodbury. This warning includes the entire Sioux City metro area (IA/SD/NE). The Winter Storm Watch in effect for Monona County has been upgraded to a Winter Weather Advisory which goes into effect at midnight tonight until 6 PM Monday. Winter Storm Warning remains in effect from 9 PM Sunday until midnight Monday night (Tuesday morning) for Emmet, Kossuth, and Palo Alto counties in Iowa.